The La Brea Tar Pits make up the richest Ice Age fossil site in the world and have been excavated since the early 20th century. We peek into the depths of a prehistoric attraction. 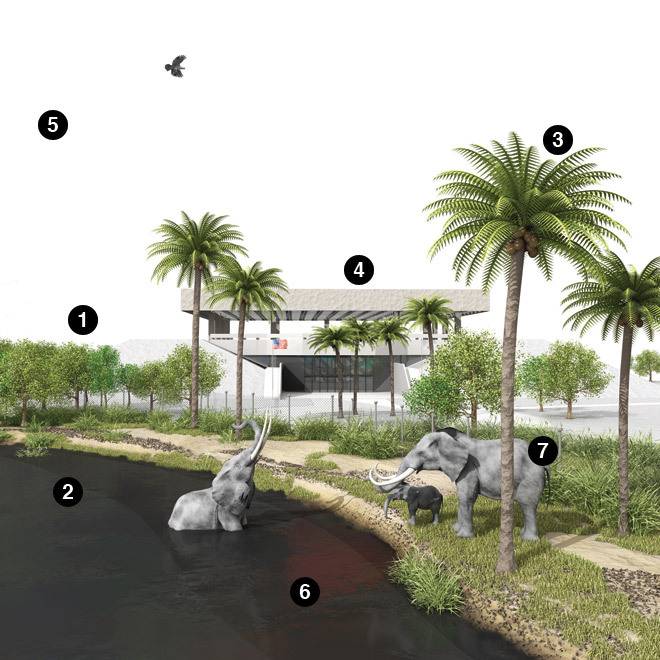 Researchers have collected more than 3.5 million specimens representing 600 animal and plant species at the site, located in the Miracle Mile. The pits still attract creatures—at their own peril. In the 1930s, a circus elephant stepped into the gunk; fellow pachyderms reportedly helped pull it out. More than 10 million years ago, the L.A. basin was under water. Deposits from tiny marine life sank to the bottom and became petroleum. As the oceans receded, it seeped out of the ground and formed swampy craters filled with what’s known as asphalt; tar is a misnomer. More than 100,000 fossilized plants have been removed from the pits, including a 14,000-year-old juniper tree. Many of the same species still grow in the current environment; the nearby Pleistocene Garden showcases a variety of scrub brush and manzanita found in the area. Most fossils from the pits are jumbled together, making it difficult to assemble whole skeletons. (The exception is Zed, a juvenile mammoth; the tusks of the nearly complete fossilized mammal are kept inside the Page Museum.) Researchers are still analyzing the microfossils (plants, bugs, and pollen) surrounding the larger bones to gain more insight into life in prehistoric L.A. When LACMA began building an underground parking structure in 2006, workers discovered 16,000 new fossil deposits dating as far back as 42,000 years. The museum continues to uncover matter from the Pleistocene era. The thick pool near Wilshire Boulevard, which was excavated as an asphalt mine, ranges in depth from a few feet to about 20. The lake pit serves as a reservoir into which irrigation water and rainwater from the surrounding park are pumped before being discharged into the sewer system. In 1967, artist Howard Ball completed fiberglass statues of three animals that resemble modern elephants. The scene of a trapped mother is inaccurate; animals get mired in only a few inches of asphalt. Also out of character is the family setup; the male would not have been present.